Pauline Baynes is one ofthe greatest of 20th century illustrators for children's literature - and one of the most loved. Sadly, she has died. Her drawings for the C.S. Lewis classic, The Lion, The Witch, and The Wardrobe, literally added another dimension to that work, investing its imaginative reaches with new levels of intrigue and pathos. I loved her illustrations in the Narnia series, and for some of the Tolkien books, too. Other great illustrators of this kind would include Garth Williams, who transformed Stuart Little, and Jules Feiffer's The Magic Tollbooth. Peggy Fortnum's Paddington Bear is also delightful. And one also recalls work for The Wind in the Willows, by numerous hands. Eyewear welcomes reader's comments on their best-beloved illustrated children's works. 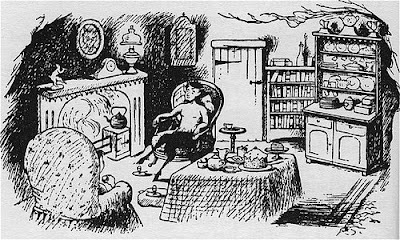 Mervyn Peake for the Alice books of course!